Note: I met my husband Alan two days before Valentine’s Day in 2003, so this holiday has become special to me. I have written a short essay about an earlier tradition on Valentine’s Day in the essay below. Every morning my mother would wrap the coins for my lunch money in one of her pretty cotton handkerchiefs, tying the opposite corners and making a soft knot that I could untie to pay for my lunch. I loved her lace-trimmed and crocheted-edged hankies, especially those embroidered with her initial B in calligraphy. I carry that memory with me every time I place a cotton handkerchief in my pocket or purse. When I pulled out my hanky at my older daughter’s, she made a funny face and commented how unsanitary a handkerchief is. I said, “I am using it only on my nose and placing it in the laundry when I get home.” She still wrinkled her nose, so I was vindicated when my sister-in-law pulled out her hanky on my last visit to see her. And when I told my younger daughter I wanted cotton hankies for my birthday, she found them online and sent them to me as a gift. No wrinkled nose there! I am not sure why men’s handkerchiefs are still readily available and not women’s. 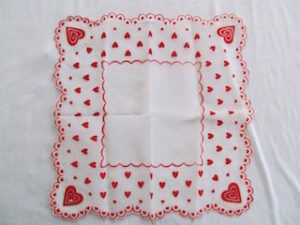 Then I saw a short article on the last page of Martha Stewart’s Living Magazine that, in the 1930s and 1940s, sweethearts bought and mailed their sweeties heart-covered handkerchiefs for Valentine’s Day. What a nice idea! This cat named Bunny belongs to my daughter and daughter-in-law. 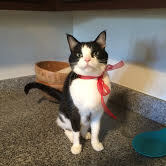 The red bow is especially for Valentine’s Day. P.S. If you don’t have a sweetheart, share this day with someone your love, like your pet, a family member, a colleague, or someone you’d like to know better. It’s all about LOVE. This entry was posted on Sunday, February 12th, 2017 at 9:50 am	and is filed under Essays (Ellen Sue Says). You can follow any responses to this entry through the RSS 2.0 feed. You can skip to the end and leave a response. Pinging is currently not allowed.